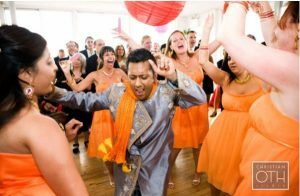 The Right Music For A Multicultural Wedding! As much as things have changed in the last twenty-five years, it is still not always easy to plan a multicultural wedding (a wedding with more than one ethnic background or tradition). Of course, there are family issues that may come into play. But the good news is that the music can meet the needs of both cultures without losing the traditional songs and genres. When planning an interfaith wedding (also known as multicultural or interracial) choose your music with your DJ, being clear that you want every participating ethnicity respected and acknowledged. You want no one left out or to have hurt feelings. This may take a bit more communication but worth it in the long run. Be sure the DJ has an adequate variety of music from all genres. If they do not, you can help them by creating a list of must-play songs enough in advance for him or her to obtain the songs for you. This past Spring I had the opportunity to DJ and MC the wedding of a couple with the Groom born and raised in the South (USA) and the Bride born and raised in France. Her family had never been to The States and her wedding was going to be their first visit. She sent me a list of songs she and her family enjoy so I could download copies of them in time. Some I couldn’t find and she offered me a CD with them and, of course, I was very grateful. We also discussed when she wanted me to play them since I did not know their history or context. They were all playful dance songs and fun but one, which was an old family favorite of her parents. It went great! Everybody had a fantastic time, despite international travel threats making it uncertain if the bride’s family was going to be able to fly! They arrived the day of the wedding and got dressed at the venue! This made the songs that she chose even more special since they were still catching their breath from landing in a foreign country. A slice of home was just the thing they needed! Often I have been asked to DJ weddings between Latino and Non-Latino couples. What we establish together is a ‘system’ of mixing in music from both cultures in little clusters. I will play a few English songs than a few Spanish songs. I find that after a few drinks and some time together, everybody joins in the fun from both sides of the family and it is like they have known each other all their lives! It is funny watching people move from Beyonce to Daddy Yankee to Meringue all in a fifteen-minute block. Moral: Don’t be afraid to plan a multicultural wedding. Plan alongside your DJ and enjoy watching the fun and blending of families and cultures right before your eyes! Photo courtesy of Interfaith Wedding Minister, Susanna Macomb and renowned NY photographers, Christian Oth Studio.